Hollywood attempts to deal with racism and prejudice, and from beneath the (not unexpectedly) glossy and often glib exterior at a somewhat leisurely pace, an often moving experience emerges. Marlon Brando is as usual almost hypnotically watchable, quiet yet commanding, relaxed but emitting coiled tension, witty, puckish yet deeply committed. 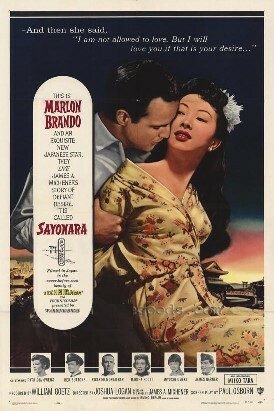 And then there's Brando own performance (in "yellowface") a year before in THE TEAHOUSE of the AUGUST MOON. Even here in very dubious (and controversial) circumstances you somehow can't take your eyes off him. Is he terrible, embarrassing, or great?